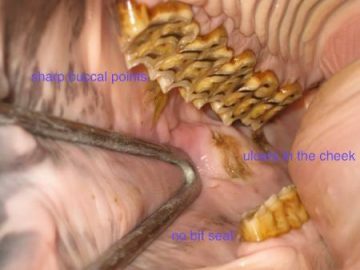 An oral examination will identify incisor abnormalities and treatment needed. The inspection will also assess the occlusion of both incisors and molars. Molars are checked to determine if occlusion is uniform end to end, and that there is no interference from bumps, ramped up or tall teeth, or hook formation on either end of the arcades. 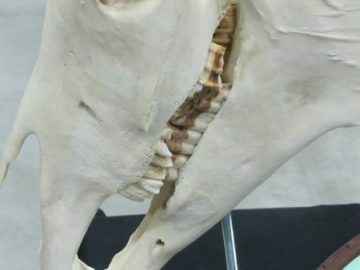 Mal-occlusion: sometimes the horse’s teeth don’t match up well and make it difficult for the animal to eat comfortably. “Wave mouth”, “Step mouth” and “Wedge mouth” are just a few of these mal-occlusion problems. 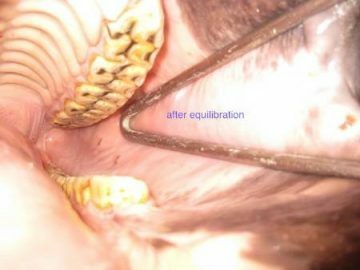 Sharp enamel points: As your horse grinds his feed, the molars can form peaks and valleys as the crown of the tooth is slowly worn down. Routine dental “floating” will reduce these painful sharp points and make your horse a more efficient eater. Retained “Caps”: as the deciduous baby teeth start to fall out and the adult teeth erupt, sometimes one or more of the “caps” (stubborn baby teeth) need a little help coming loose. These retained caps can be painful and even become a source of infection if left without treatment. Bit irritation: For any horse, a comfortable mouth is essential, so the bit can function as it was designed. A “bit seat” is placed on the first cheek teeth to ensure no interference or pain caused by bit or teeth. Nearly all horses develop sharp enamel points on the outside of the upper cheek teeth and on the inside of the lower cheek teeth. Sharp enamel points can affect both eating and performance by hurting cheeks and tongue. The sharp enamel points should be floated. Horses should have their teeth floated before going into training as the bridle will push the cheeks into the sharp points making the horse uncomfortable. The bit will push/pull tissue into the sharp enamel points causing pain. From age two until five, the mouth is in a volatile state of change. the mouth continues to change throughout the life of the horse, but no changes are as great as these early years. During these times, the horse is struggling with the cutting or loss of twenty-four deciduous/ “milk teeth and the eruption of thirty six permanent teeth. Horses five and under should be seen every six months and horse over five should be seen at least once a year. A healthy mouth promotes a healthy body and a willingness to work with the trainer. If your horse’s haven’t seen an Equine Dentist in the last 12 months they need one. Good dentistry helps horses get more nutrition from less feed and improves their performance. 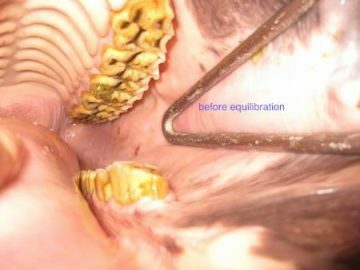 Equine Dentistry Made Easy to Understand Parts 1-10 is an educational and informative video for those of you new to dental work. Every horse owner should watch these videos.